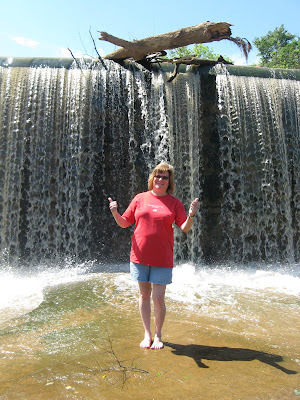 My boys took me to the Bull Hole in Cooleemee, North Carolina today for Mother's Day. We didn't load up and carry the grill. After all, it's Mother's Day, and Mom grills a lot. So, grilling would not be a break and a special treat. 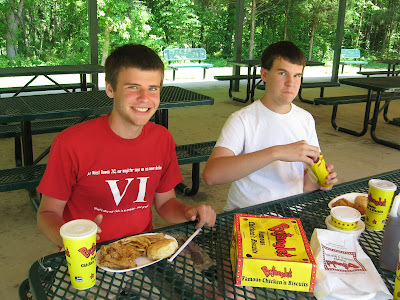 Instead, the guys got Bojangles chicken for a picnic. If you've never had Bojangles chicken, then you are missing out. While I can't tell you it's healthy, it's sure yummy Southern chicken and spicy. My youngest son loves Bojangles so much that he set his GPS to show him the closest one when he's driving. No gas stations. No hospitals. Just Bojangles. We know his priorities. 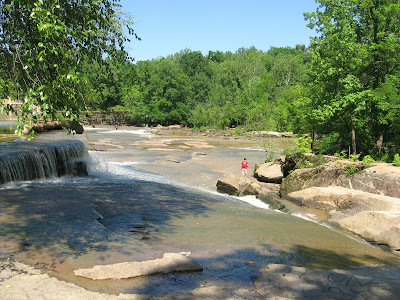 The Bull Hole is a park in Cooleemee, NC. 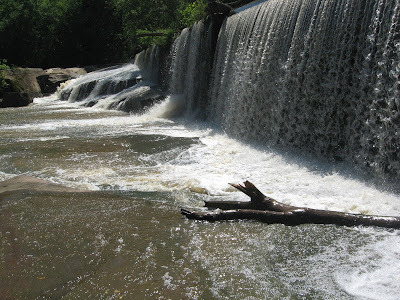 I think it was a dam used to power the mills back when Cooleemee was a mill town. I know, for sure, that it was a favorite hang out in the 70s for local teens. That probably (almost surely) was not legal. But, now they have turned it into a park. The Bull Hole is still generally one of those off the beaten track places that not many people know about and visit. But, it sure is pretty, and it's fun. The atmosphere is rustic, to be sure, and you do not want to wear your nice clothes. It's the rare person who goes to the Bull Hole and doesn't fall in at some point. The tailgate special at Bojangles is a good bet if you do not want to take the time to pack up the grill and prepare the food. The price is good too. Hit the drive through and be sure to ask for plates and sporks. And cups with ice for the great sweet tea. Then, you are all set. I managed to cross over to the center at the Bull Hole without falling in. This may be a first. The bottom is really slick. We saw a lot of people who did wipe out including one girl who lost her cell phone. Leave valuables on the side before wading in the river. Otherwise, you may lose your stuff or get it wet. We always meet new buddies at the Bull Hole. This is a Southern friendly kind of place. For more photos, check out the Bull Hole Photo Album at Facebook.